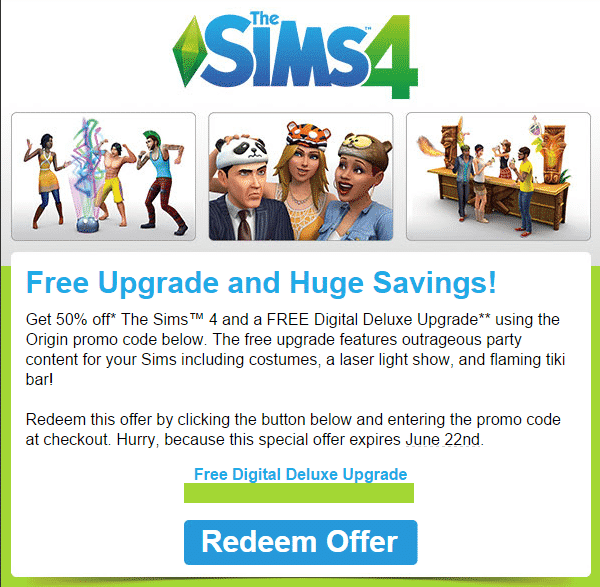 EA recently sent out a promotional email offering a free upgrade to the Digital Deluxe edition when purchasing The Sims 4 (which is currently 50% 0ff) through Origin. This email and promo code is for new purchases of Sims 4 only, previously purchased copies don’t apply. Click Here to purchase The Sims 4 for 50% off! To receive future offers and promotions like these, be sure to sign up for The Sims 4 Newsletter. I have received the email but cannot see the promo code. Help!